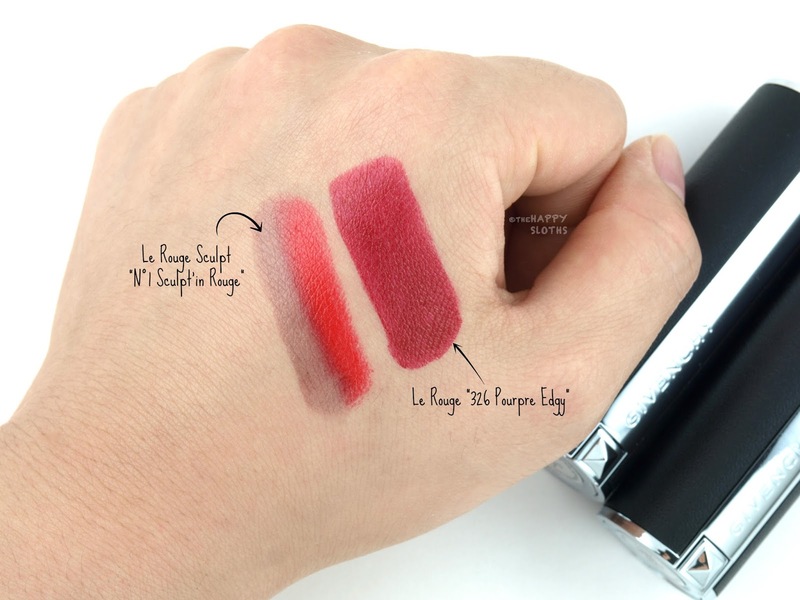 Housed in a shiny silver tube wrapped with genuine leather, the Le Rouge Sculpt is a two-tone lipstick consisting of two contrasting shades designed to make the lips appear more volumized. There are a total of five shade combinations and I have here "N°1 Sculpt'in Rouge", a combination of a sheer bright red and a color-enhancing black that changes to a sheer vampy pink when applied on the lips. Before I delve into the formulation, I want to discuss some issues I had with the packaging. 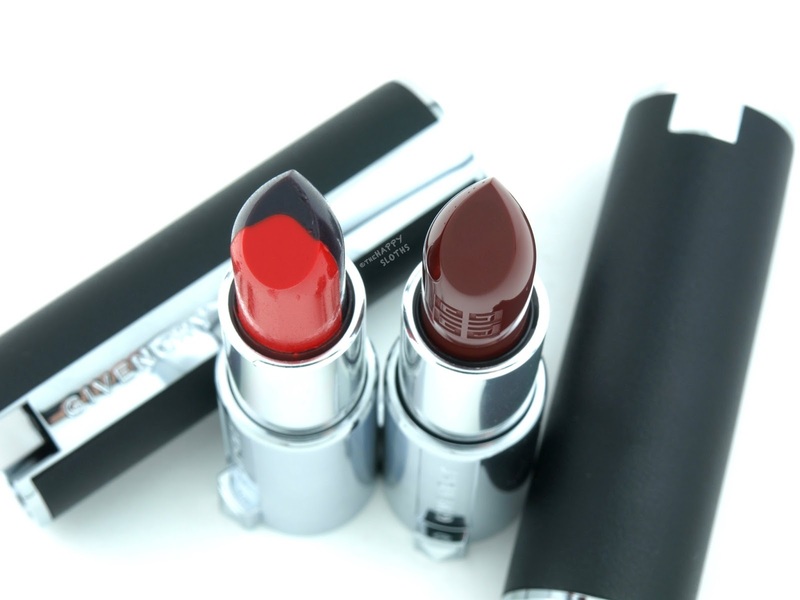 As you can see, the lipstick bullet is divided right down the center into two portions: the red lipstick and the black shade-enhancing balm. The formulation of the two are quite different (with the balm being very soft and fragile) so they don't actually "bond" very well together. Therefore, the lipstick broke right off the base when I tried to use it for the first time. I fixed it with the old candle flame trick but the lipstick broke again, this time with the two portions separating from each other. I'm not sure if this is an issue with the other shades in the range but for this balm and lipstick combination, it's definitely a dealbreaker. 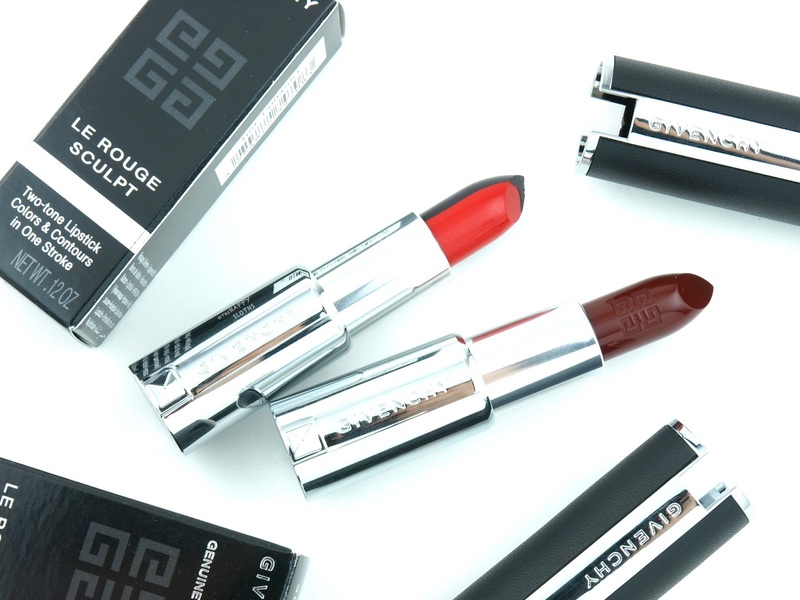 Givenchy Le Rouge Sculpt in "N°1 Sculpt'in Rouge" & Le Rouge in "326 Poupre Edgy"
Formulation-wise, "N°1 Sculpt'in Rouge" is sheer but hydrating. The balm contains eosin which changes color according to the lips' pH. The red is quite bold but it's not an opaque red, which actually works well as it blends beautifully with the balm to create a unique ombre lip. The combination provides a flattering optical illusion that makes the lips look super plump and voluminous (see lip swatches below) but the packaging flaw is hard to overlook. Givenchy Le Rouge Sculpt in "N°1 Sculpt'in Rouge"
The Givenchy Le Rouge Lipstick collection currently has 14 shades and for Fall 2017 (available starting August 3rd), the brand is adding seven additional shades, some of which were released previously as limited edition colors and some are brand new. 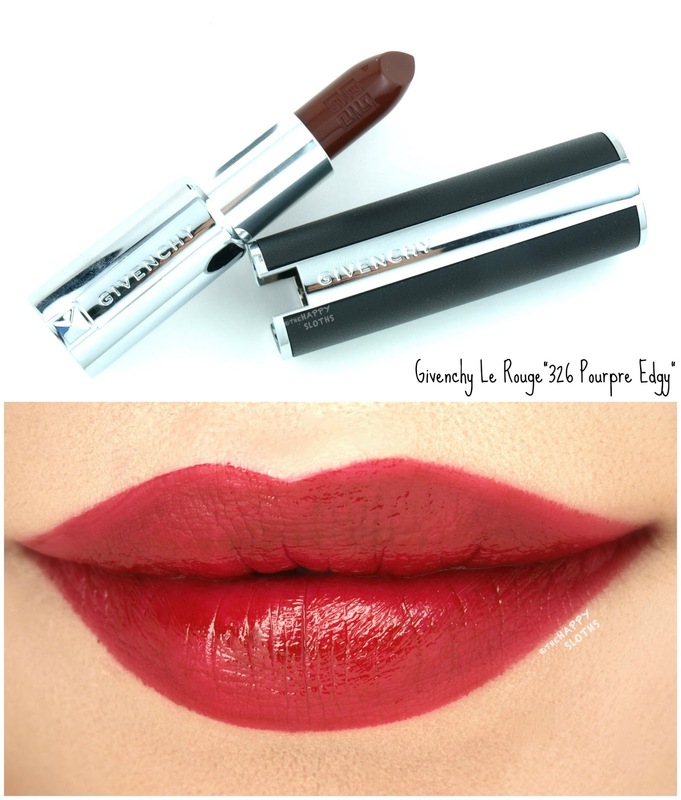 I have here the shade "326 Poupre Edgy". This color appears as a super vampy brown red in the tube but it actually applies like a dark wine red on the lips. Pigmentation-wise, the color is very rich and intense. However, there is some patchiness, even if your lips are scrubbed and prepped. 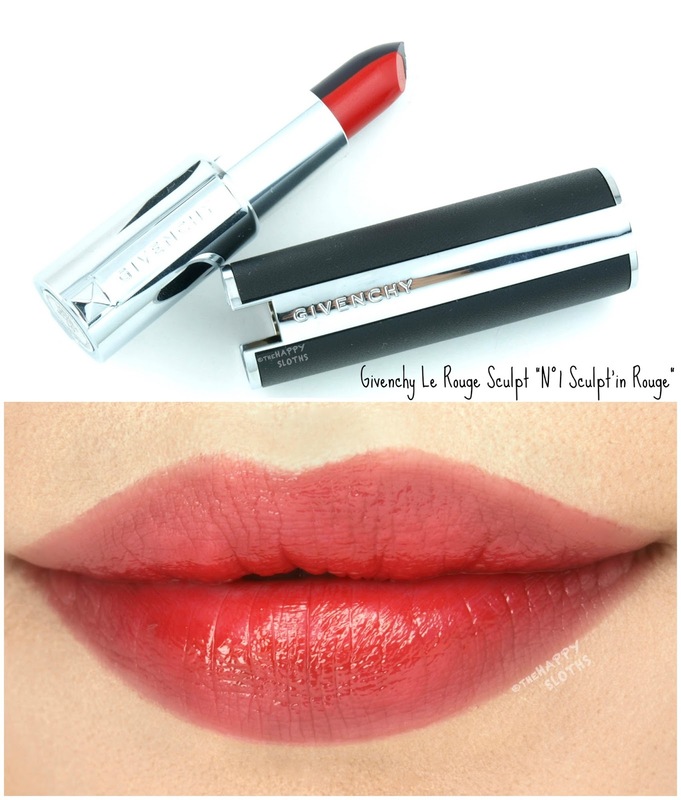 The Le Rouge formulation has a lightweight, slick, and hydrating wear. There is a bit of a sheen in the finish and the color wears for at least four to five hours with minimal fading. "326 Poupre Edgy", in particular, leaves behind a lovely tint so even when the lipstick fades, your lips will still look nice and pink. Finally, the Le Rouge packaging is identical to that of the Le Rouge Sculpt; it's super edgy yet elegant at the same time. 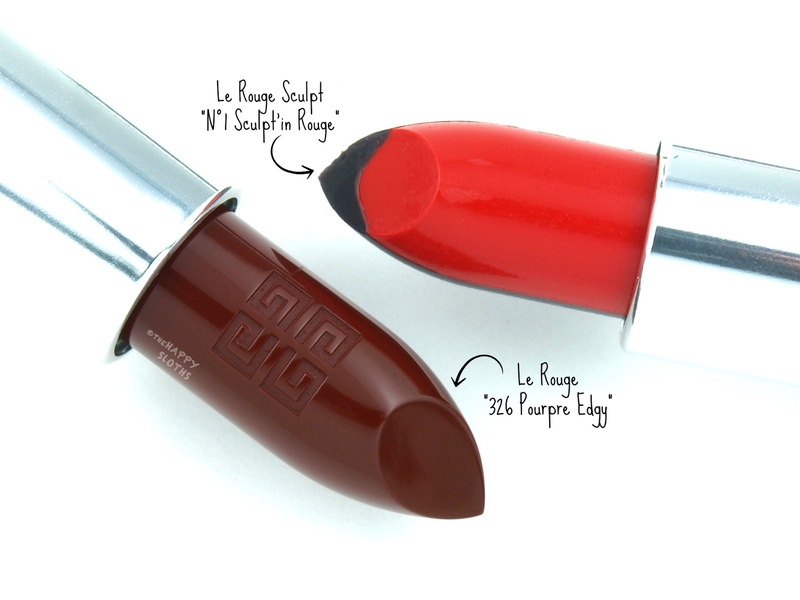 Givenchy Le Rouge in "326 Poupre Edgy"
So what are your thoughts on these two lip colors? Are you a fan of the ever-so-popular ombre lip trend? Share with me in the comments below! Givenchy is available online and in stores at Sephora. The Le Rouge Sculpt and the new Le Rouge shades are available starting August 3rd, 2017.